Some time back a customer came into Fibre + Clay and we got talking about Knitting Novels. 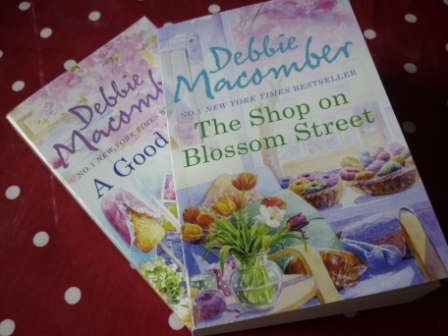 She recommended Debbie Macomber’s Blossom Sreet series. I dutifully wrote down the details, promising myself that next time I got to a bookstore I’d look out for them. Anyway … the weeks passed and that piece of paper is still in my bag. There just hasn’t been the time or the money for book shopping this month. Imagine my surprise when that same customer turned up this week with two paperbacks under her arm “These are for you” she said. Don’t you think people are just so nice? The elderflowers are out, it’s time for elderflower panna cotta!